Owain Kirby is a Stirling based freelance illustrator working with the print medium of lino-cut. He grew up in the West Highlands close to the village of Strontian. 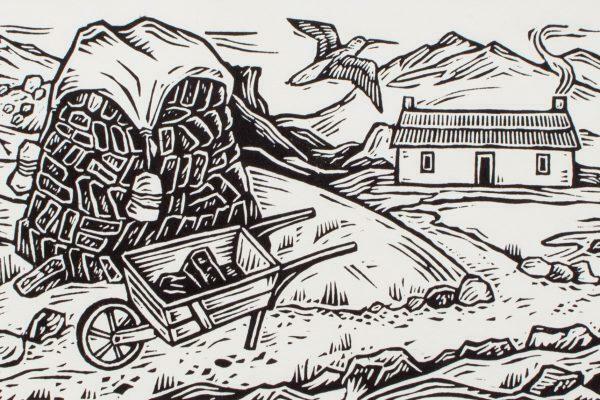 Owain attended Duncan of Jordanstone College of Art in Dundee where he studied illustration and printmaking, before finding his creative language through the medium of lino-cut. Lino-cut is a printmaking technique similar to that of woodcut. Linoleum, originally a floor covering developed in the 19th century, is carved to form a printing block from which impressions are taken – either using a printing press or in Owain’s case through burnishing with a spoon. Owain’s illustrations have been commissioned by clients in Design, Advertising, Publishing, as well as in the Editorial sector. Editions of his prints seldomly exceed four copies. Owain also works in education as a supply teacher encouraging enthusiasm for art and creativity. He has a passion for art, history, music and occasionally the hazardous game of shinty.